CHICAGO -- D.J. 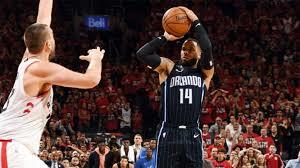 Augustin sank a 3 with 3.4 seconds to go and the Orlando Magic went on to beat the Toronto Raptors, 104-101, in Game 1 of their Eastern Conference playoffs showdown on Saturday at the Scotiabank Arena. The smallest man on the court at six feet and 193 pounds, Augustin came up big with 25 points and six assists in 31 minutes of play. His 20 first-half points helped the seventh-seeded Magic build an early 16-point lead over the No.2 seed Raptors. Before scoring the game-winner, Augustin also converted a game-saving lay-up that tied the score at 101-101 with 44.9 ticks left. "I've always been doubted, but I'm still here," the 31-year old journeyman, who has played for eight teams in 11 NBA seasons, told ESPN after giving Orlando a 1-0 lead in this best-of-7 series. Nikola Vucecic and Aaron Gordon combined for 21 points and 18 rebounds for Orlando, while the Magic bench came through, outscoring Toronto's reserves 31-26. Kawhi Leonard, in his first playoffs game in a Raptors uniform, tallied 25 points, but he missed a potential game-tying 3 that would have sent Game 1 into overtime. Paskal Siakam finished with 24 points and nine rebounds and Marc Gasol added 13 markers. Toronto made 40 of 88 field goals (45.5 percent) and 12 of 36 triples (33.3 percent) but they got out-rebounded 48-45 and shot only 14 free throws against the Magic's 20.